Three in a series of four. Looks like a buttercup to me, quite large clumps of roots and will spread with runners if left. I would agree. I am a bit plagued by this one. Very difficult to remove completely due to the runners. Every time I think I've completely eradicated it...........guess what? Definitely one for your trowel, Peter. Make sure you get it all out. It's at the bottom of my dead lavender so I should be able to have a good go at it without damaging too much. 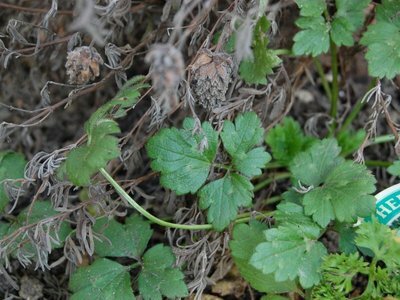 creeping buttercup, loves light sandy soil, is a pain, in your lawn. I have this all over my small front garden and it's a real pain. You think you've got rid of it all, then it shows itself again. Unfortunately, I thought it was a plant and left it in for the summer, it then spread itself ALL over the place. All I can suggest is that you just keep a very close eye on it and when you spot it get it out as quickly as possible. It's like a spider and spins a web of runners which get everywhere. It is such a shame as it has lovely small yellow flowers and attractive foliage. Mine also started under a lavender - I wonder if Lavender 'attracts' them or something? « Two in a series of four. Anyone know what this is? Thanks for the help.